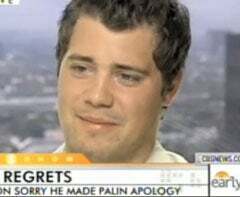 Levi Johnston has taken back his apology to Sarah Palin. But he's clearly learned a lot from them, as he claims being the mayor of Wasilla isn't "about qualifications." In an interview with CBS taped yesterday, Johnston said he regretted the apology to the Palin family he issued last month. He explained, "the only thing I wish I wouldn't have done is put out that apology 'cause it kind of makes me sound like a liar. And I've never lied about anything" (in the apology, he said, "I publicly said things about the Palins that were not completely true"). He now claims that he and Bristol wrote the apology together, and that he had to issue it in order to make her and her family happy. As I've always said, I prefer Levi as a thorn in Palin's side rather than an ally, but he's starting to look pretty erratic. Has he done anything that hasn't been reversed two weeks later — aside from impregnating Bristol, that is? Levi Apologizes To The Palins, But Why? Levi also had some pretty Palinesque things to say about his vaunted mayoral run. Betty Nguyen's unvarnished skepticism in the clip above ("you've never run for a political office before, you don't have a high school diploma") is pretty fun to watch, but it doesn't appear to make a dent in Levi's baseless confidence. The thrilla from Wasilla is looking less like a hottie and more like an automaton all the time — note how his mouth barely moves at all as he says, "whoever the people love most, they're gonna vote for." At this point I think he may be an android created by the Palin camp to perform some purpose that's not yet clear — although they should really have programmed him a little better. When Nguyen asked him about Bristol's upcoming Dancing With the Stars appearance, all he could muster was, "I recently heard that, yeah... Great. Go for it." Evil robot scientists of Alaska, it's time to step it up. Earlier: Levi Apologizes To The Palins, But Why?